Are you looking for a secure way to destroy sensitive information like customer contracts, business records, and bills? Look no further than Gone4Ever Shredding. We are a leading provider of document shredding services througout Gainesville and Alachua County. Our name is one that you can trust. We currently fulfill the shredding needs of dozens of local businesses and would love the opportunity to speak with other business-owners in the area about becoming a client of The Arc’s Gone4Ever Shredding program. Don’t wait. 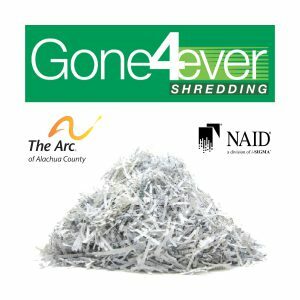 Contact us to learn more about Gone4Ever Shredding at The Arc!